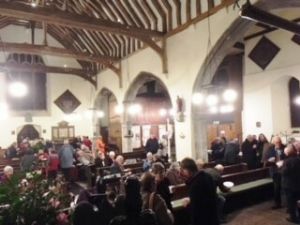 The Friends of St Mildred’s Church is a charity established to assist in the maintenance of the fabric of the Parish Church of St Mildred and to preserve and protect it as a place of Christian worship and a place of local gathering for the local community. It is a lovely organisation of people who live around the St Mildred’s area. They do not all come to church; the group is open to those of all faiths and none. They are bound by an interest in seeing that this ancient church remains vertical. The Friends organise a wide range of events to fundraise. Jazz, film nights, concerts, talks, quizzes, trips and tours beyond the parish are all designed to delight and stimulate and the wine and refreshments are lavish and legendary. Join the Friends and you will win friends. Application forms are available just inside the door. There is an information sheet about the Friends and history of the church. For more information, go to the history of the church building on this website. Email Tessa Taylor or use the Contact Us form. Alternatively telephone the number below.